Every year, the Schuylkill Center gives the Henry Meigs Environmental Leadership Award to a deserving environmental professional for leaving a meaningful and lasting impact on their community and our region, and embodying a spirit of leadership, integrity, and vision. In twelve years, we’ve never given this honor to an environmental artist—but that changes this year. On November 7th, Stacy Levy will be presented the Meigs award for her pioneering work joining the worlds of art and science throughout her career of creating compelling artwork, both site-specific and gallery-based. In Levy’s words, she “use[s] art as a vehicle for translating the patterns and processes of the natural world.” Today, creating novel modes of revealing natural systems and solving ecological challenges have become critical, and artists have an important role to play in connecting people with nature. Levy is among the preeminent environmental artists working today, and is unmatched in the elegance with which her work reveals ecological processes that otherwise may go unnoticed. She has broken new ground in working not just in but with the environment. 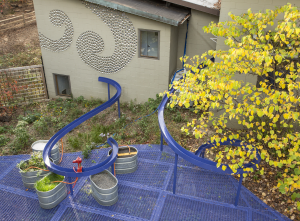 Along with showing how nature works, Levy has created many projects that solve environmental issues in a place. 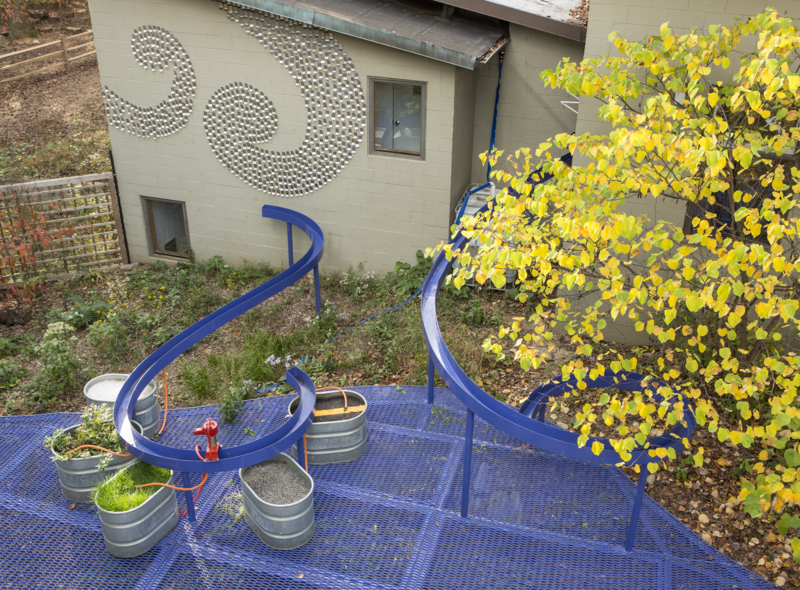 For an example of this, we need look no further than out the back door of our Visitor Center, where we can experience Rain Yard, Levy’s 2013 artwork which manages stormwater runoff from our roof. Operating in this intersection, Levy has a spirit of collaboration and uncanny ability to galvanize community members and specialists across disciplines. After being presented the award, Levy will be joined by a panel for a discussion on the intersection of art, science, and the environment particularly through the lens of water. Then, we’ll celebrate the opening of a new installation by Levy in our gallery with a reception. We recognize that environmental leadership can take many forms, and in this year’s Meigs award, look forward to celebrating how artists can shine as environmental leaders. This entry was posted in Environmental Art, Uncategorized. Bookmark the permalink.